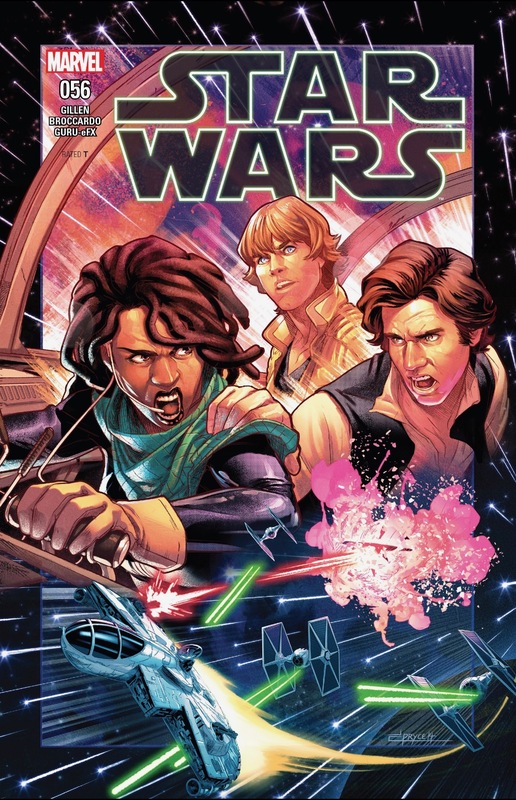 Discussion in 'Star Wars: Books & Comics + Legends' started by SWNN Probe, Nov 9, 2018. First off, let me give huge props to artist Jamal Campbell on this Drew Struzan homage cover. This is probably my favorite cover of the titular series, so far. After the dreadful events of 'Hope Dies', our heroes are regrouping and licking their wounds. Han’s been separated from the Millennium Falcon, Leia is unable to contact the Rebellion, and Luke is long off the path to becoming a Jedi. Fortunately, they’ve found an ally in Sana Starros, who will lead them to one of the more unique celestial destinations I've seen in the Star Wars Universe. SPOILERS AHEAD…. It's hard to imagine the place our three heroes must be in psychologically. The Rebel Alliance was on the verge of having a fleet that could challenge the Empire. Han seems especially rundown by these events, lamenting how he's sick of running. Nevertheless, they persevere but are very much hunted as they hide under the table from these bucketheads. Sana has picked them up after they barely escaped and she's taken pity on them. 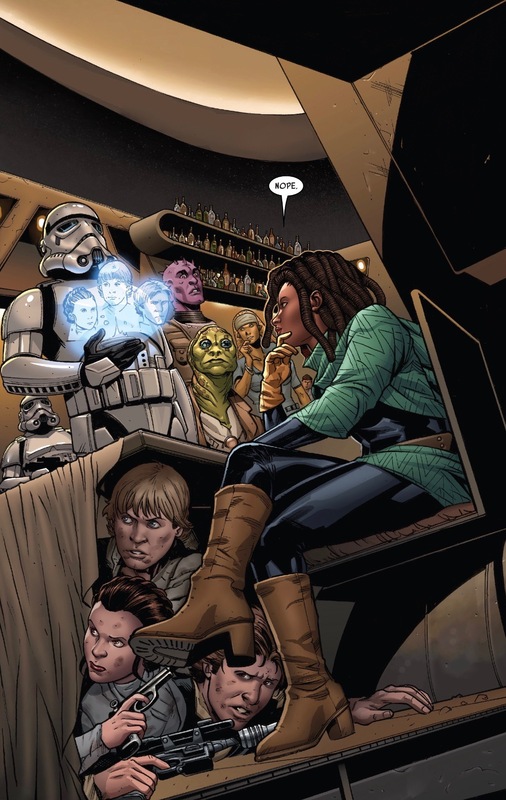 Sana is currently featured in Doctor Aprha, but judging by comments writer Kieron Gillen has made about this arc taking place closer to The Empire Strikes Back, I'm gonna assume this is after those events. Just wanted to welcome new artist Andrea Broccardo to the series. Love his touch so far. The characters are familiar but it's still a departure from how we are used to seeing them. Following a lead from Sana's friend, the crew decides to leave for the planet Brental IV, hoping to find someone who may be able to contact the Rebel Alliance. It's a big chance they have to take, but Sana agrees to shepherd them there, though she does say she's going to charge them. This makes me think she's never fully joined the Alliance and is more of a freelancer, something I bet Han wishes he was from time to time. I don't know about you folks, but I love it when these stories take us to natural wonders of that galaxy far, far away. This cluster of moons is explained to be the densest in the galaxy and it's often used by smugglers. It's a pretty cool nod to Jupiter and it's many moons. I hope an updated atlas of this galaxy comes out in the next couple of years. It would be cool to see all of these locations cataloged. 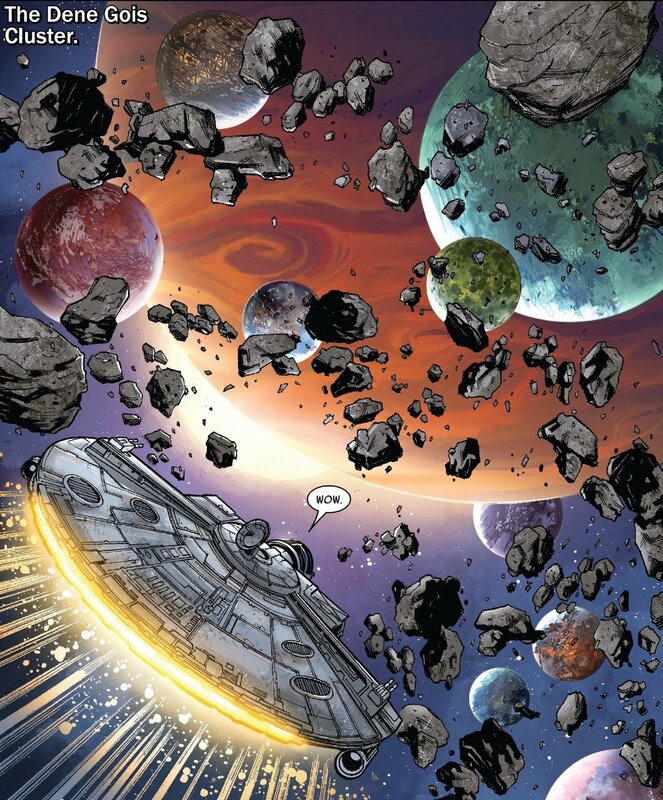 Well, of course, the Empire has to come and bust up a pretty scene like this. Luckily for our heroes, the cluster has shielded them from detection for the moment. Sana doesn't think that 'fly-casual' is any kind of solution, so she suggests her three fugitives abandon ship. There's a moon called Hubin that is considered isolationist, which Sana says is perfect for them. Given they have less than a minute to decide, the heroes and droids board an escape pod. There's a funny moment when Threepio is triggered by the prospect of getting in an escape pod, considering where it landed him last time. Our heroes crash on Hubin, not sure what to find. It appears to be a planet overgrown with dense forest, something Luke still hasn't become accustomed to with his Tatooine upbringing. It's not long before they meet their first inhabitant. This beast arrived to greet them and sure looks hungry! A pretty serious chase ensues and our heroes are cornered in by the thick overgrowth of the forest. As the creature approaches, a mysterious cluster of lights blinds them all and scares the predator away. A group of what appear to be hunters or warriors steps forward from the darkness. Okay, wow, these folks look cool. 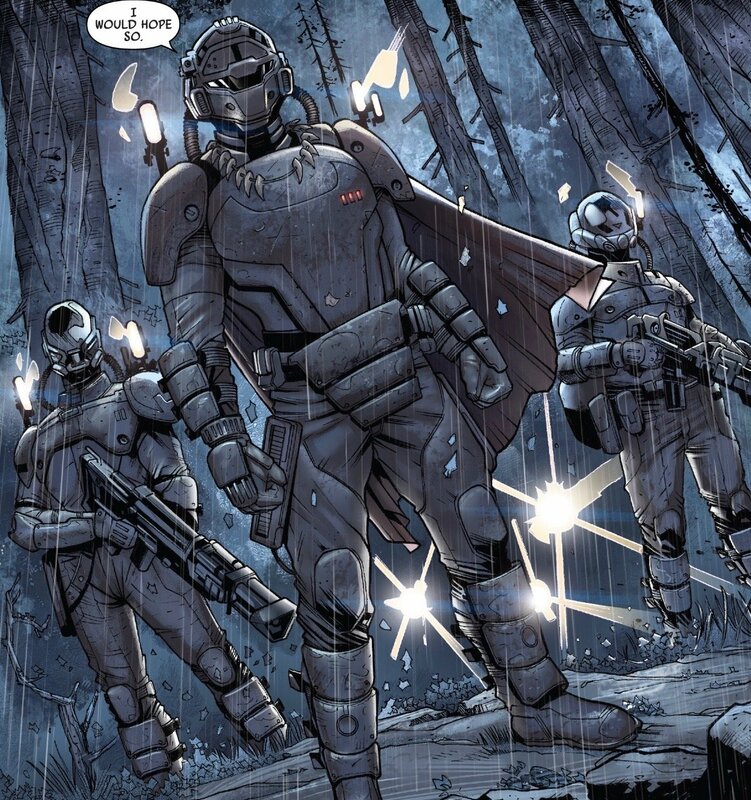 I love the hybrid use of different armor popping up more and more in Star Wars attire. Whoever they are, they disappeared far too quickly in this issue. It's got me wondering if this is the contact they were promised would get them in contact with the Rebel Alliance. They are quick to offer assistance. Leia, Luke, and Han don't seem to know what to do since they haven't been received too warmly on other worlds they've dropped into recently. 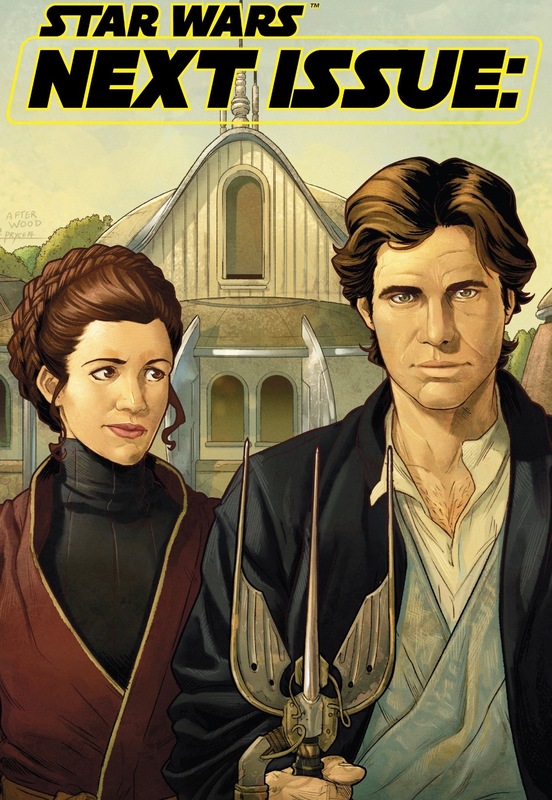 Obviously, some sort of time-jump occurs and we meet back up with a dry, sun-soaked transformation of Leia, Luke, and Han. It's not explained how they got to this strange mansion or if it's even on the same planet. All we see is this droid making a tricky cocktail that has to be mixed just right or it's toxic. 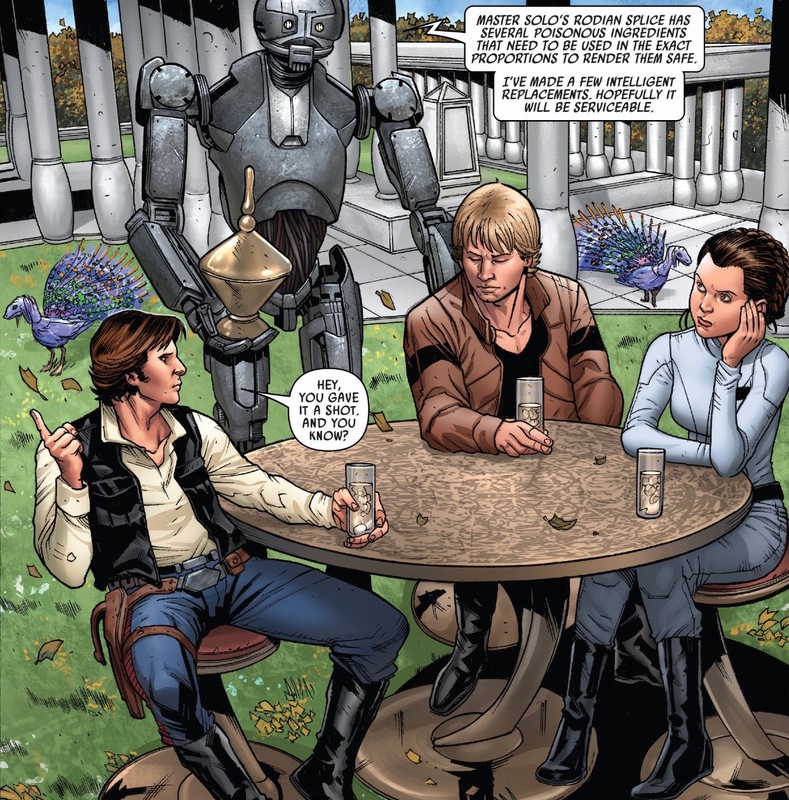 There's no information given on how these three ended up in this more temperate climate, with a droid serving them drinks. This is where the issue ends and we are at the beginning of another adventure with our old friends. The change in art is the most notable and welcome difference in this first issue of 'The Escape' arc. In my opinion, Sana disappeared far too soon and I hope she finds her way back to rejoin these three. They'd do well to make her more of a regular character. Also, the transitions between locations was very jarring, but I'm guessing that was intentional. 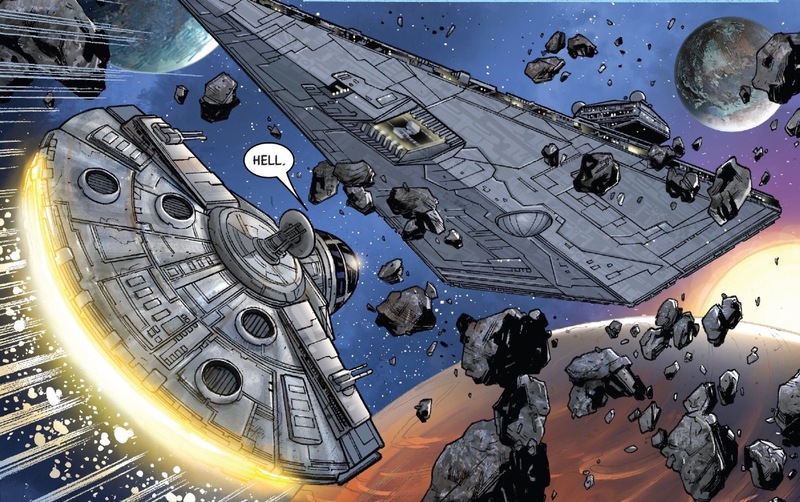 We didn't learn anything about the state of the Rebel Alliance or Chewbacca's whereabouts, so we'll have to hope that comes up in the next issue. 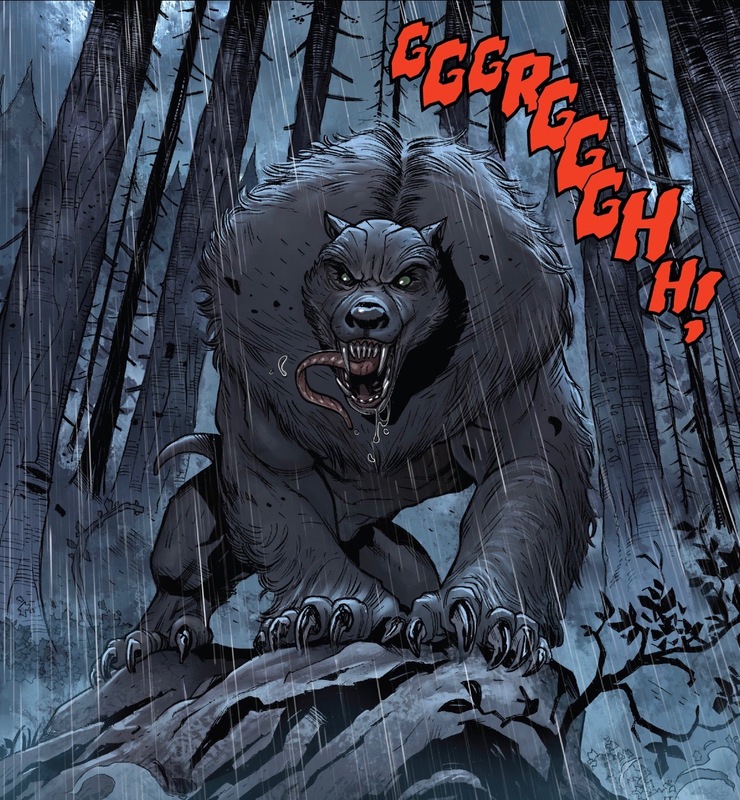 I feel like this is a good start to the arc and Kieron Gillen has been pretty consistent. 'Hope Dies' was one of my favorites, so I have high hopes for this, no pun intended.